When I was first invited by these clients they had only been in this home for a short time, having had a second baby only two weeks earlier. Their previous home had been smaller, darker and more traditional and they were struggling to make this bright modern home work. The extra space and light was great but their period pieces were feeling very dark and heavy and the dining table now was very small in the space. As with a lot of homes, there was a distinct lack of storage too. This modern home was built over 4 split-levels with lots of stairs for little people to navigate – we needed to find some solutions that would make living here easier. The alcove in the kitchen dining area housed an old sofa yet wasn’t big enough to be a proper lounge area. 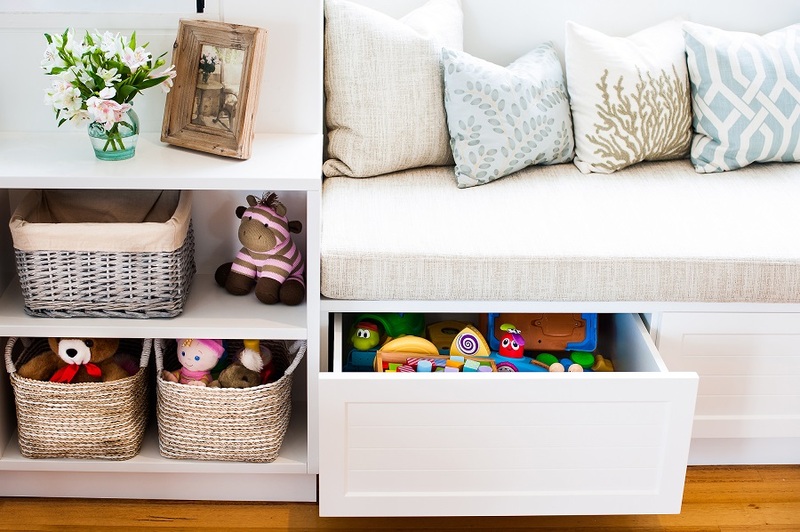 The clients wanted storage for the kids toys and soon found going up and down two lots of stairs very tedious every time their baby and toddler needed to be changed. 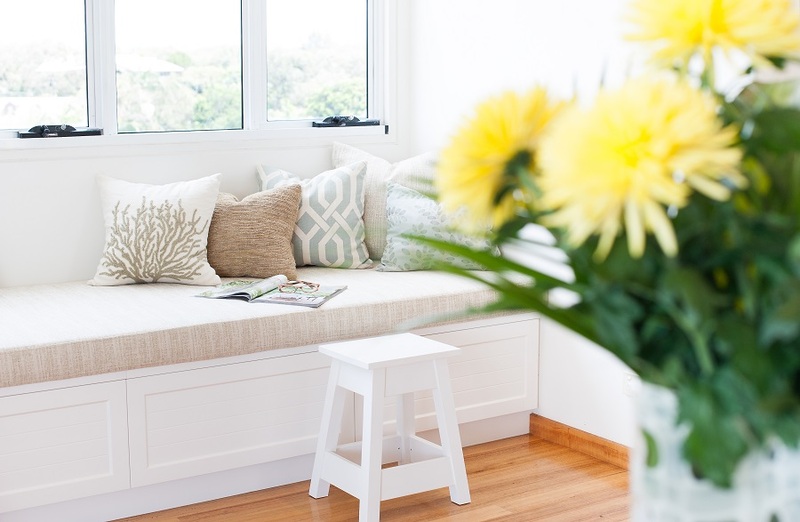 My design solution was to build a lovely bench seat from wall to wall with pull-out drawers that could accommodate toys and a baby change mat, nappies & wipes to minimize their stair workout. We also built an open bookcase that was ideal to display adult and kids’ accessories. 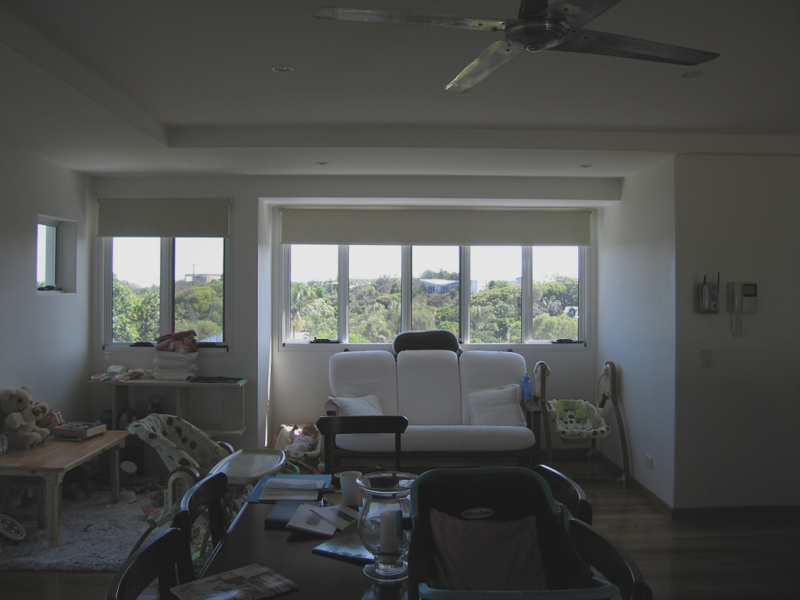 The clients wanted this home to have a smart coastal feel, a bit Hamptons but still a place that was child friendly. The Vintage Cross Oak dining table looks great as you walk up the stairs and the leather dining chairs are easy to keep clean. The beautiful rug is protected by a clear sheet of perspex (not pictured) so spills from the high chairs are not a drama. 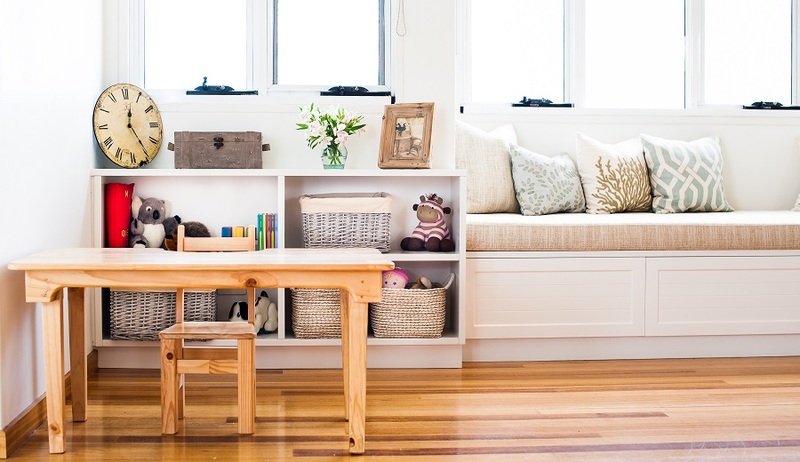 What once was a very cluttered, awkward space is now restful, ordered, useful and beautiful. What’s more the clients love it and so do I! Love to hear what you think. Leave a comment or send me an email if you like any of the items featured in this home.